Imperial in stature and bigger than your average stout. This colossal stout was inspired by those created by 18th century English brewers for the Russian Imperial Court of Catherine II. The special malts in this intense and massive brew delivers rich flavors of dark chocolate, coffee, and anise. Had it a few years back, just remember that it tasted of licorice and coffee. A very strong taste and very full bodied brew. I remember that after 4 or 5 of these monsters I was feeling pretty good, I guess attributed to the 9.2 abv. I will have to revisit this one soon. Drank 5/9/14 @ World of Beer Evanston. Minimal tan head; minimal lace. Black licorice & fresh earth nose. Coffee grounds, fresh earth, molasses & mild black licorice flavors. Dark & complex, yet drinkable. From notes 12/30/11: Pours a deep brownish black with 1+ inch lasting, mocha, fine bubbled, foamy head that leaves moderate lace. Aroma is roast, dry figs, prune, coffee, chocolate anise and pungent hops. 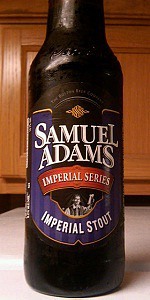 Taste is similar but with more anise/licorice from mid-sip into the aftertaste. Notes of char in the aftertaste. Mouthfeel is medium bodied with low carbonation, mouth coating. Pours black, with soft, chocolate colored foam. Smell is full of chocolate and licorice, with a hint of soy sauce. Starts of slightly boozy, dark chocolate, licorice and a bit of coffee. Nice balance, and nice aftertaste. Medium bodied, good level of carbonation. Overall, a good Impy, a bit more muted and a bit too thin for me than the really excellent ones. Poured from a brown 12 oz. bottle. Has a black color with a 1/2 inch head. Smell is of dark fruits, roasted malts. Taste is roasted malts, alcohol, light hops, some dark fruits. Feels medium/full bodied in the mouth and overall is a decent beer, but not a great example of this style. Stiff black pour on this one. Tan colored head, 3/4". Impressive. Substantial roast and dark fruit notes, alcohol wafting. Taste is more roast, more dark fruit, but the bitterness is lightly tamed. A bit of anise, chocolate malt, coffee and toffee malt notes. These are good, the format is nice, better for sharing on a cold night. Pitch black pour, visibly thick, with a dark espresso head that is slow to rise to the surface. Smells like roasted malts, dark cherries, walnuts, lactose and scotch whiskey. Promising! The taste doesn't disappoint - dried fruit (figs, raisins) covered in dark chocolate, freshly roasted coffee beans, vanilla, oak. A warm spicy aftertaste with notes of pepper and anise. Super thick mouthfeel, a bit choking at times, but quite pleasant. No carbonation present. Thick pour with thin lacing, small dark brown foam. Smell: molasses, wet brown sugar, vanilla, roasted barley. Taste: Same as smell with significant lingering sweetness, hop bitterness noted going down mixed with light alcohol heat. Has a thin mouthfeel, was expecting chewy feel as the pour looked thick.